Full- and part-time staff members are eligible to elect one of three medical plans through UPMC: an EPO, a PPO or a CDHP with an HSA. CDHP is free to full-time staff electing employee-only coverage. Full-time staff who decline coverage will receive an opt-out bonus of more than $1,560 annually. You are eligible for MetLife dental benefits the first of the month following 30 days of employment. Our dental plan features one free cleaning per covered individual every six months. You may contribute up to $2,500/year on a pre-tax basis to a medical flexible spending account and up to $5,000/year on a pre-tax basis to a dependent day care flexible spending account. You will receive $50,000 in company-paid life insurance. You will also receive company-paid accidental death & dismemberment insurance, as well as long term disability. There is no cost to you for these benefits. Coverage is available through Aflac. The Wellness Center is available free of charge for employees and their spouses. 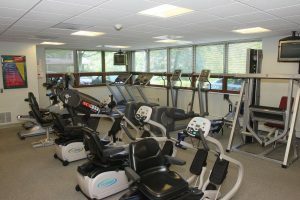 It is accessible 24 hours a day and contains a variety of fitness equipment including treadmills, elliptical, and weight machines. You are eligible to participate in our retirement program from day one of your employment. After one year of employment, BHS will begin to match 100% of your contributions on up to 3% of your pay. Additionally, after one year of service, you will receive a discretionary match from Baptist Homes Society into your 403(b) account subject to plan provisions. As part of an incentive plan, if the organization reaches certain financial goals, an additional 1% or 2% match may be issued. Employees are vested after 3 years of service. BHS provides a vision discount plan that you and your dependents can take advantage of – at no cost to you. MetLife VisionSavings Eyecare Program gives you discounts at many leading eyecare providers including LensCrafters, Pearle Vision & Sears Optical. You can also receive a discount on your exam. The card also gives you a 15% discount on LASIK. BHS provides tuition reimbursement up to $5,250 per fiscal year for full time employees and up to $2,500 per fiscal year for part-time employees, after six months of service. BHS contracts with Cigna Life Assistance Program for its employees. All BHS employees are eligible for anonymous counseling sessions through a toll-free number. Additionally, all callers are offered a free face-to-face screening or assessment session. The LAP is provided at no cost to you. The Employee Sick Bank is a voluntary short term disability program which runs with BHS’ fiscal year, July 1 – June 30. The purpose of the sick bank is to assist employees who are unable to work for an extended period of time, as a result of their own personal illness. It provides members with an additional 440 hours (up to 11 weeks) of PTO annually for use during their personal extended illness. All employees who have at least 24 hours of accrued PTO may participate in the Sick Bank during annual open enrollment. Employees may access the sick bank only if qualified for an episode of personal illness covered under FMLA, and they have taken off 5 consecutive work days for their own illness. BHS provides employees with 0.07 hours of Paid Time Off (PTO) per hour of work for full time and part time employees up to established maximums. For a full time employee working 80 hours per pay, this equals out to 6.15 hours per pay, or 20 days per year. After two years of service, the accrual goes up to 0.08 hours per hour of work, or 22 days per year for full time employees. PTO is to be used for vacation, holidays, personal days, illness or emergencies. All employees of BHS have the opportunity to join the Omega Federal Credit Union. The credit union provides many great services such as checking and savings accounts, home loans, car loans, etc. BHS has partnered with many local merchants to offer its employees special discounts on many commonly-used services and products. Participating merchants include Salon La Te Da, Stout Flooring, Life Uniform, and many more! BHS employees also enjoy significant discounts through AT&T, Verizon Wireless, and Sprint on their cellular phone plans. Ride the Bus or Trolley to work? BHS offers you the option of paying for your monthly bus pass through two pre-tax (saving you federal and state taxes) payroll deductions per month, rather than having to pay for your pass all at once! No need to pay for an expensive garage lease – BHS provides free parking for all of its employees. This listing provides a general summary of benefits, which are subject to change. Summary Plan Descriptions and/or policies should be reviewed for more detail.